Cygnus A: A galaxy, some 700 million light years away, with a central black hole. Caption: Chandra's image shows a giant football-shaped cavity within X-ray emitting hot gas surrounding the galaxy Cygnus A. The cavity in the hot gas has been created by two powerful jets emitted from the central black hole region. 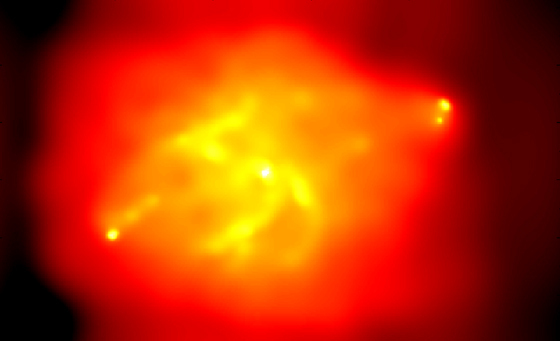 The jets themselves terminate in radio and X-ray emitting "hot spots," some 300,000 light years from the center of the galaxy. Scientists believe that fast atomic particles and magnetic fields from the jets spill out into the region, providing pressure that continuously inflates the cavity.